Your success drives everything we do – and we mean everything. That’s why we offer the industry’s broadest portfolio of applications, data, security and infrastructure services. And that’s why we’ve built a deep bench of passionate, proactive experts across the world’s leading technologies — delivering unbiased solutions to help you thrive in a complex, multi-cloud world. Your purpose is our purpose. Whether you need to spark innovation, adapt faster to a changing marketplace, or get more out of limited IT resources, we have the right people and the right technologies to get you there. 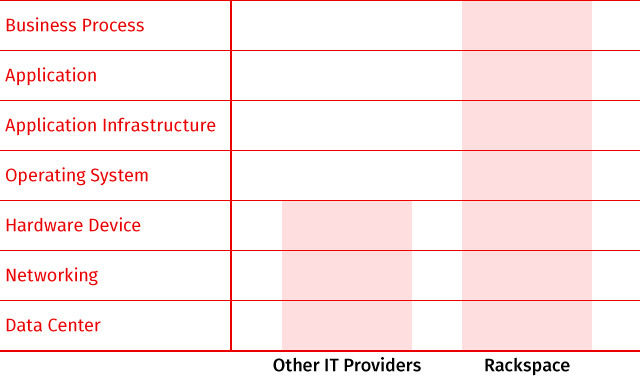 And unlike other providers, we can do it across the entire technology stack. Focus on your business, knowing your cloud infrastructure is in good hands. As a Leader in Professional and Managed Services for public cloud infrastructure, Rackspace goes beyond simple migration assistance and infrastructure management, with global multi-cloud managed services, professional services and managed application services. Apply your passion and expertise to helping our customers thrive in a complex, multi-cloud world. Our engineers, systems administrators and solutions architects draw from two decades of experience supporting companies — and solving their toughest tech challenges — in more than 150 countries. And because we’d never rest on our laurels, we’re constantly adding new certifications and mastering the latest and greatest technologies that matter most to your business. From first consultation to daily operations, Fanatical Experience® means we combine the power of proactive, always-on service and expertise with best-in-class tools and automation to deliver technology when and how you need it. It’s an evolution of Fanatical Support – the results-obsessed customer service that’s been at the core of what we do since 1999.